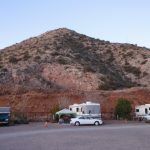 Queen Mine RV Park is about the only choice if you want to actually stay in old town Bisbee, Arizona itself. There is a cool looking place called the Shady Dell that used to offer hookup spaces, but now only rents out their own vintage trailers, but they are not within walking distance to anything worth walking to that I saw. 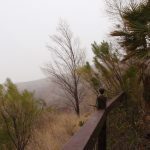 There is another park that was more expensive down just outside of Naco, at a golf community but while it looked okay, the location didn’t interest us. 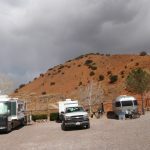 Luckily, the Queen Mine RV Park is a good one. It’s not fancy and there are no amenities to speak of, but the location is the best option besides trying to boondock on one of the side streets which would not be easy even in smaller rigs. 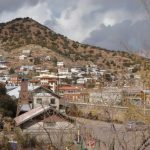 One challenge of trying this would be finding a spot that is anywhere close to level so your appliances run efficiently, since nearly every street is sloped. Finding parking during busy season itself would be difficult, let alone something for anything more than a pickup with a camper. 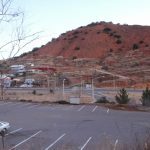 Here are some pictures of the park, all of which are taken from the gravel lot toward town and toward the back of the park overlooking the mine. We also had an Airstream sibling at the park while we were there, and a twin of the truck, sans the canopy. 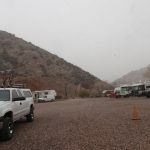 The Queen Mine RV Park is located just across the main highway from old town Bisbee, above the Queen Mine Tours location and there’s a tunnel for cars with a sidewalk that makes it easy to walk to town without having to dodge traffic. 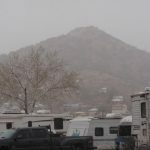 The arrangement of the trailers is basically in a big circle around the edge of the lot, with about 70% of the spots having a view out the back of either the mine (this was our view) or towards town. The lot is all gravel and kind of loose packed, at least in our area, so it has a bit of squish to it as you drive or walk which felt a little funny but didn’t cause us any trouble. As far as amenities go, there is a laundry room, and bathrooms and that’s it. I think they might have had a book exchange in the office, and a small basket of DVDs you can borrow for free. They also have wifi that you need to get a password for and it was decent although not great, and cable hookup. The daily rate is $28 per night and they offer weekly and monthly discounts. I believe we paid somewhere around $165 for the week, so it basically is like getting one night free. The monthly rate was $450 which I thought was reasonable. These rates included taxes. There are a total of 25 spaces, and they fill up very quickly. We had to wait 3-4 days for a spot to open so we could get in. The park is managed by a very nice lady who stays in her own RV on site. My only complaint about the park was that I had some items shipped to us while we were there, and the manager turned away the FedEx truck because she didn’t recognize the name, so I had to chase them down for about 15 minutes so I could get my stuff before we rolled out. 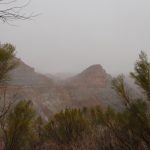 During our time in Bisbee, it was really, really cold a couple nights around 7 and 4 degrees, and the pipes for just about everything froze at the park and in town. I don’t blame this on the park in any way, the same thing was happening everywhere. 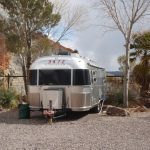 The Queen Mine RV Park’s website doesn’t give too many details about the park itself but there are a couple photos and the rates are on there too, in case they change by the time you’re reading this. 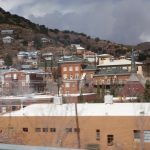 « Bisbee, Arizona – Cute but COLD!